With the needs of our Canberra and multi day bike tours in mind we selected the Specialized Sirrus and Vita bicycles for our hire fleet. 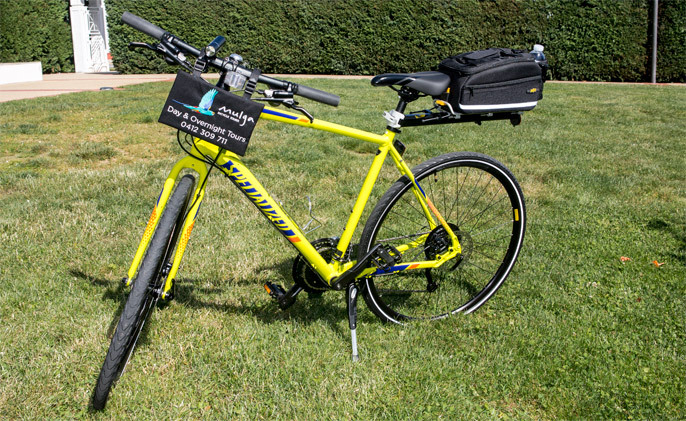 All our hire bikes are fitted with a water bottle cage, front and rear flashing lights and a rear rack and bag. These are comfortable and durable hybrid bikes with a wide range of gears similar to our own personal touring bikes. This gearing enabled us to ride up every hill but one when we cycled unsupported around Australia in 2009 and 2010 and we were carrying 55kg of gear. We are confident our hire bikes will enable you to ride to the top of all the hills on all our multi day tours as long as you have undertaken adequate preparation. The bikes have more than enough gears to allow you to cycle the flat and undulating terrain covered on our Canberra Bike Tours. If you require us to provide a bicycle for our multi day tours please make sure you add a hire bicycle to your booking. To enable us to match you with the correct sized bicycle please ensure you provide us with your measurements when you complete the Guest Personal Information Form. If you are booking on our multi day tours and wish to bring your own saddle and pedals from your bike at home we can fit them to our bicycle so you have that additional familiar level of comfort. Please note we ONLY hire bicycles to guests booked onto a Mulga Bicycle Tour or Canberra Bike Tour.